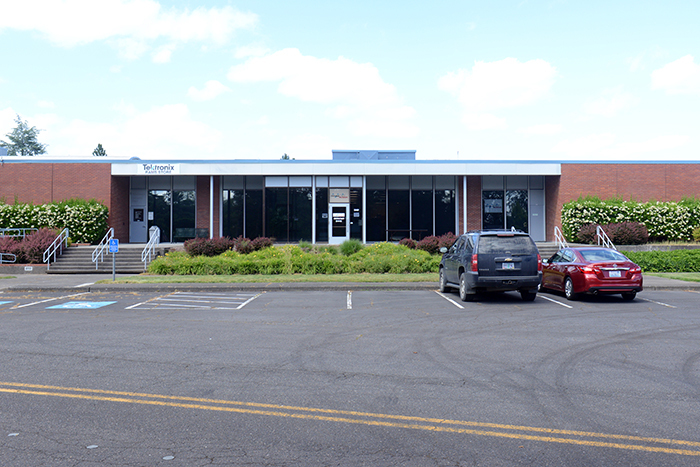 Enjoy a brief Photo Tour through the vintageTEK museum. It is much more impressive to visit the museum in person and experience the instruments in operation. Most products in the museum are fully operational. 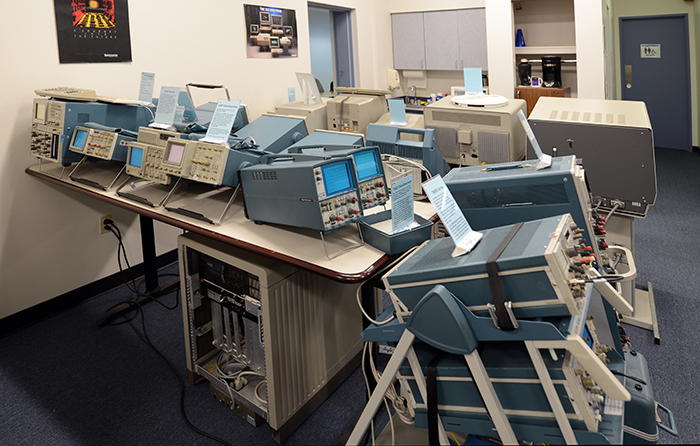 Exceptions include the Transmission Electron Microscope and items that were parts of larger integrated systems. Enjoy the tour! 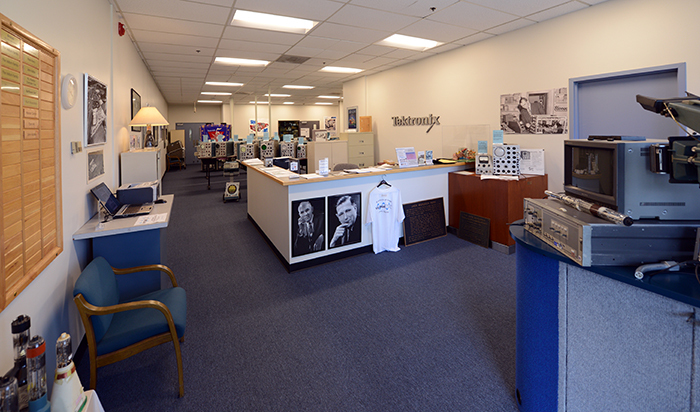 The vintageTEK museum entrance is to the right of the RAMs store through the breezeway. This is the entry into the museum. Either our host at the front desk or a volunteer will greet you upon entry. 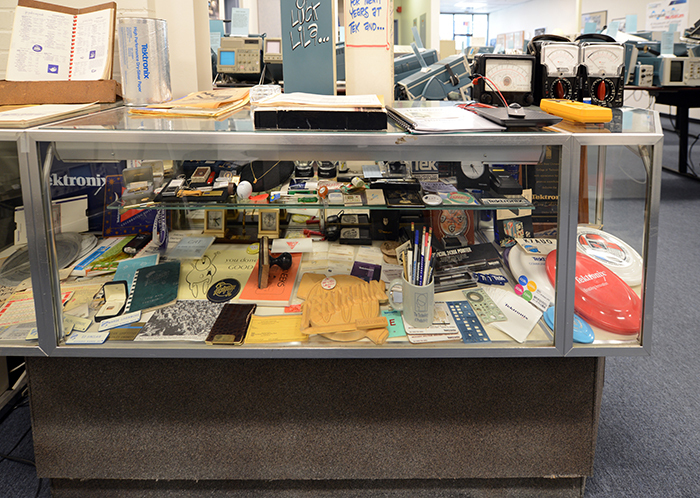 To the side of the entry desk is our CRT exhibit and key contributor plaque. 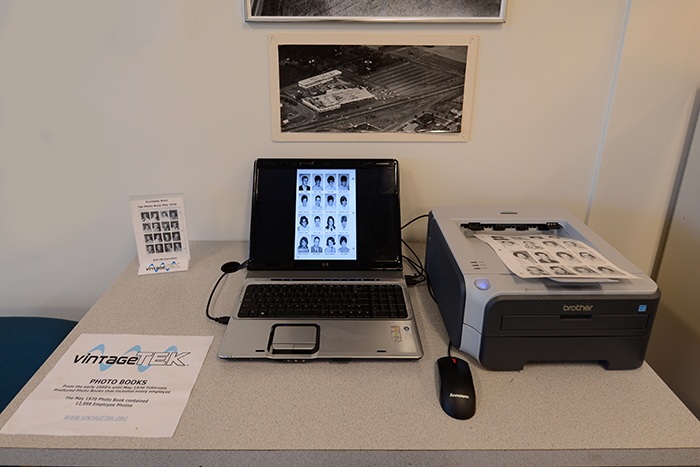 This is our digital Tek Photo Album exhibit. 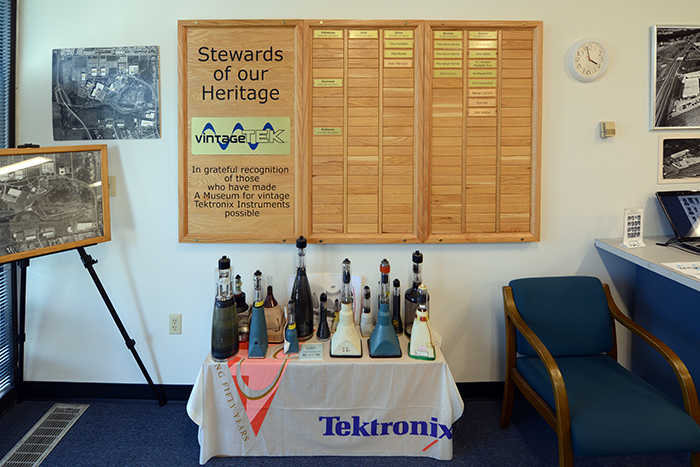 Tek produced a Photo Album of its employees from the early 1950s to 1970. There are 12,999 photos that you can search, display, or print. 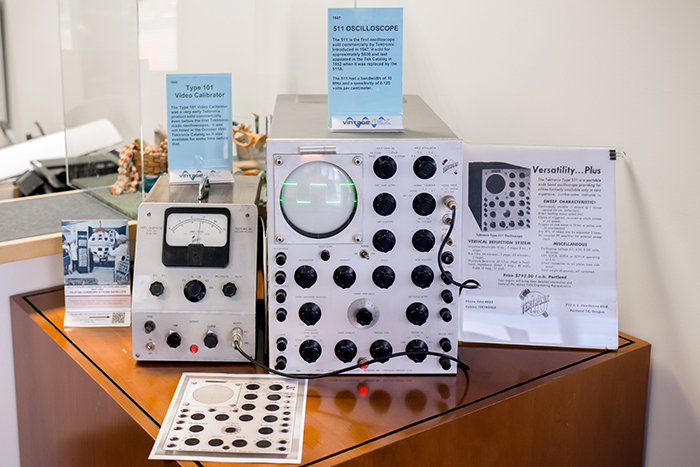 Our highlighted exhibit is our Type 101 and 511 representing the first products of Tektronix. Both are fully operational. 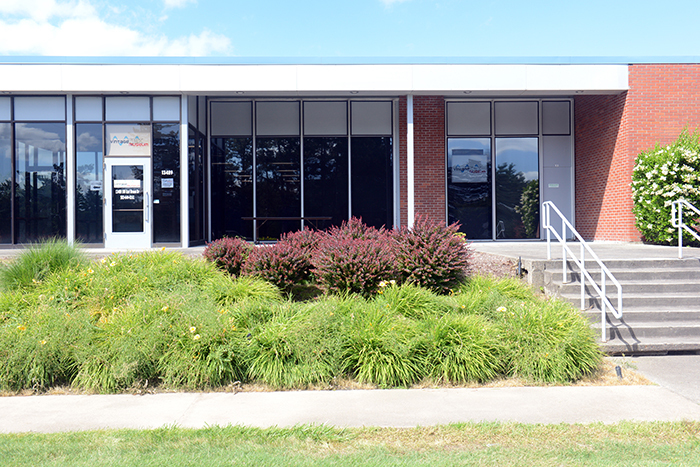 Facing the front window is our Tek Patent, Curve Tracers, and 1 GHz Scope exhibits. 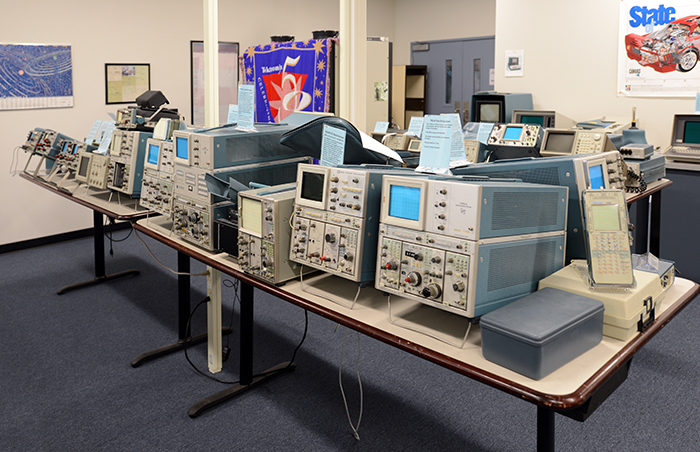 All Tektronix patents from 1956 to 2010 are listed and can be searched by title or inventer. 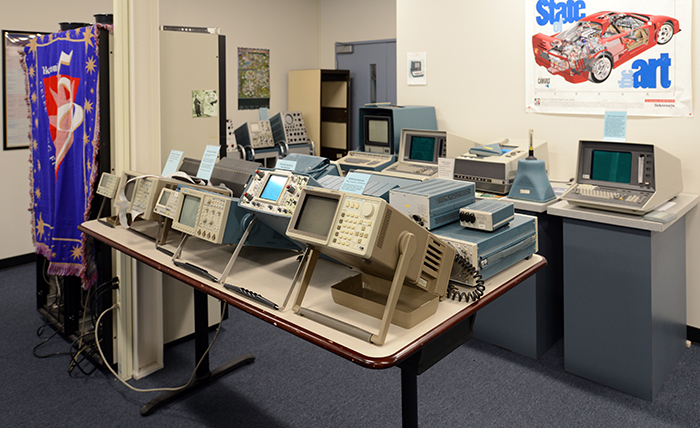 This is our exhibit of the first generation of monolithic Scopes. 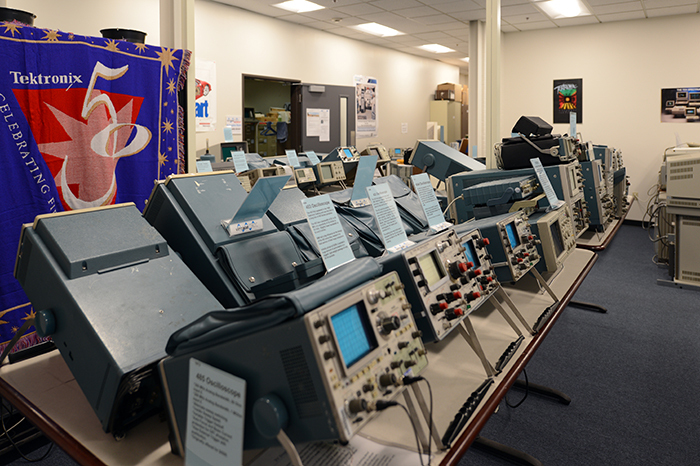 We also have a display of the first generation of plug-in Scopes. Our exhibit of portable Scopes features a screen display from of the Tek logo and Wizard from a demonstration generator. This generator was requested for a Type 310A at Bar Gauge in Tokyo. The Demonstration Generator is available on the vintageTEK eBay store. 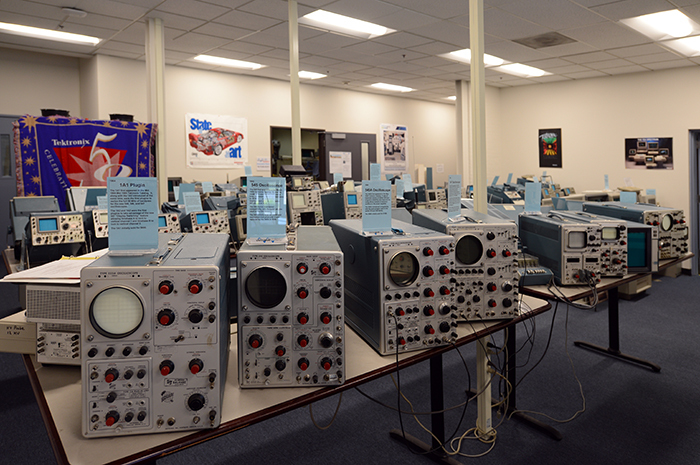 And of course we have 5K, 7K and 11K laboratory Scopes on display with a variety of plug-ins. 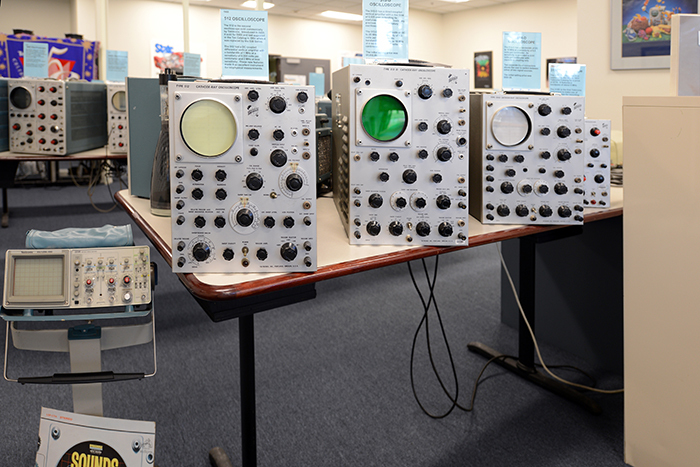 We have a number of miscellaneous scopes and scope accessories on display. 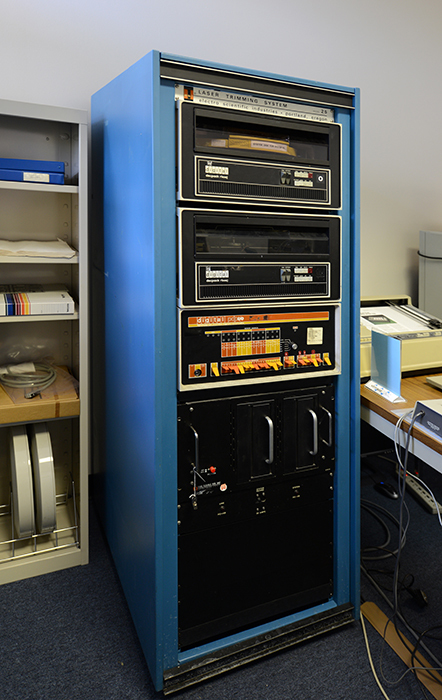 Below the table is an exhibit of the 4909 10 user 32 MByte disk. 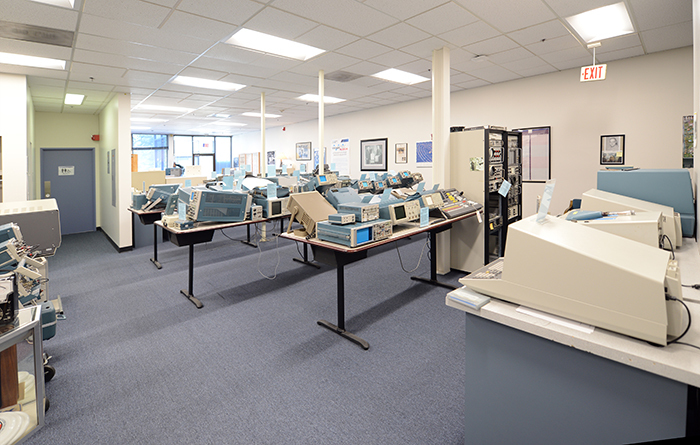 We have a number of logic analyzers on display. 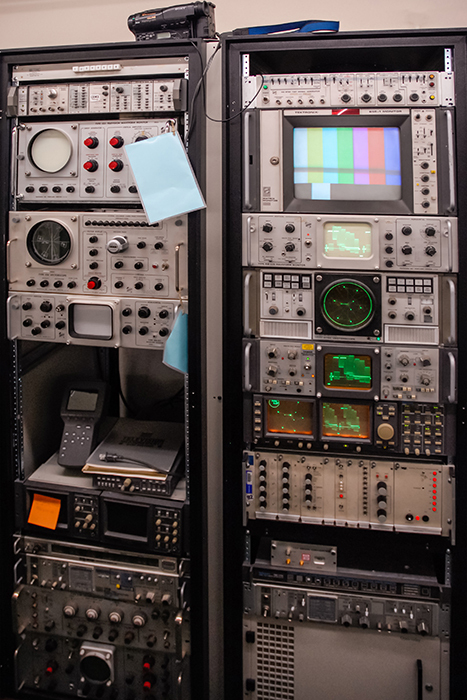 Our television display consists of two racks full of waveform monitors, vector scopes, and other TV T&M gear. This is an view of the museum display area looking towards the front door from our restoration room. 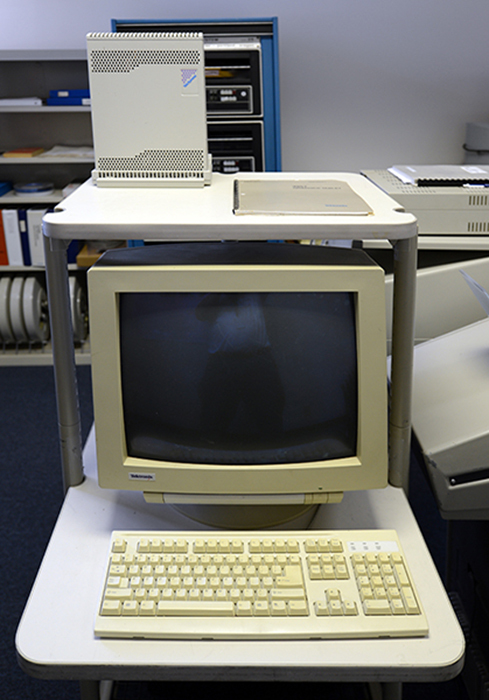 We have an exhibit of the first T4002 Graphics terminal, and 4051 and 4052 Desktop Graphics Systems along with the 4631 hard copy unit. The 4051 has been upgraded with a flash RamPack which currently has over 100 programs loaded. 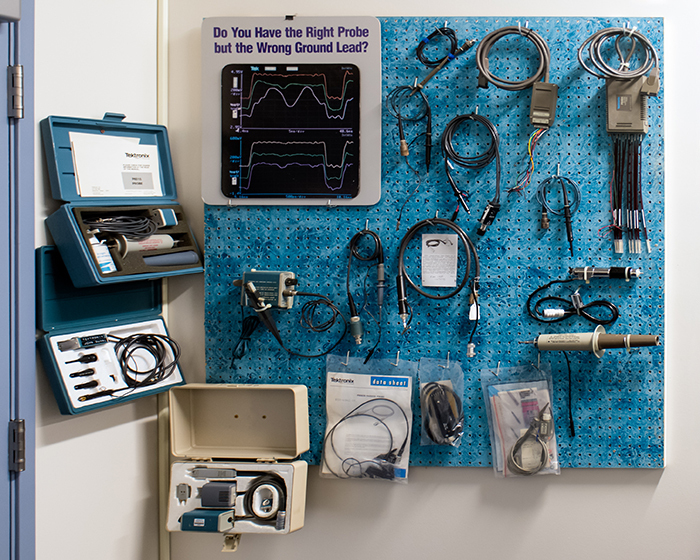 We have a wall display of various analog and digital probes. 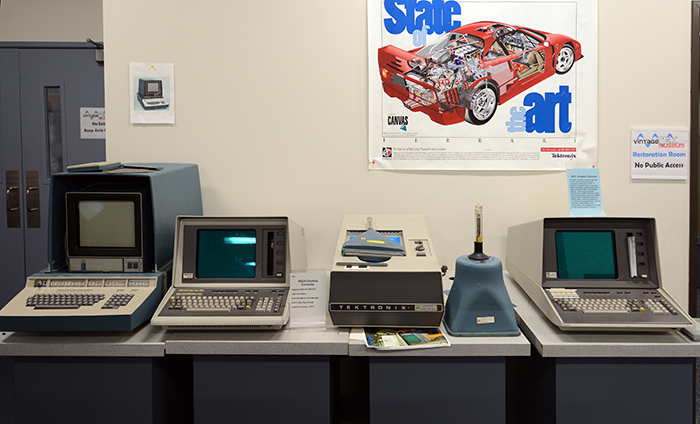 This is our display of DVST and Color Graphics Terminals as well as a 3D CACHe system. The DVST terminals run a continuous display of plot files. 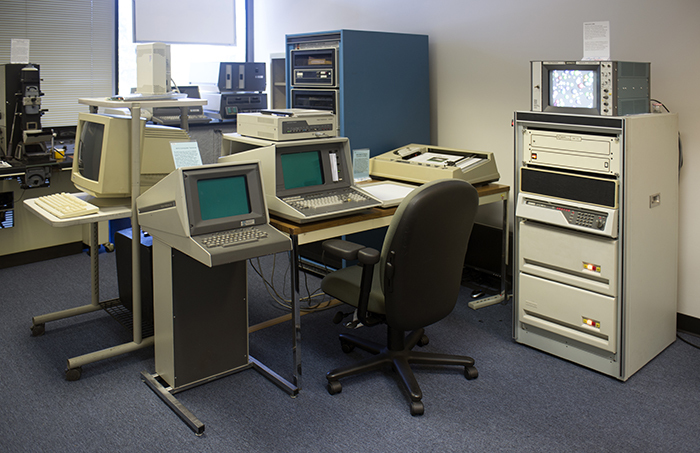 There are more DVST graphics products and the Tek Labs DEC PDP-11/34A on display. The DVST terminals run a continuous display of plot files. 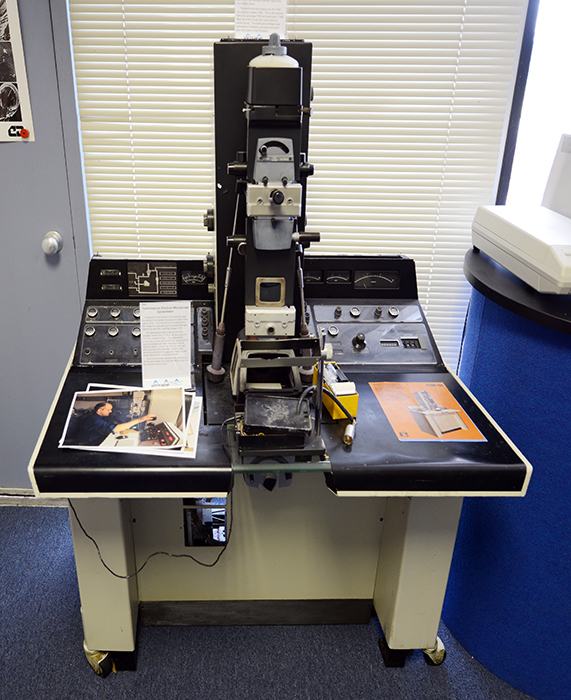 Our Transmission Electron Microscope is the #2 prototype built in 1968. Alas this TEM is non-functional as several electrostatic lenses in the column were removed for parts. 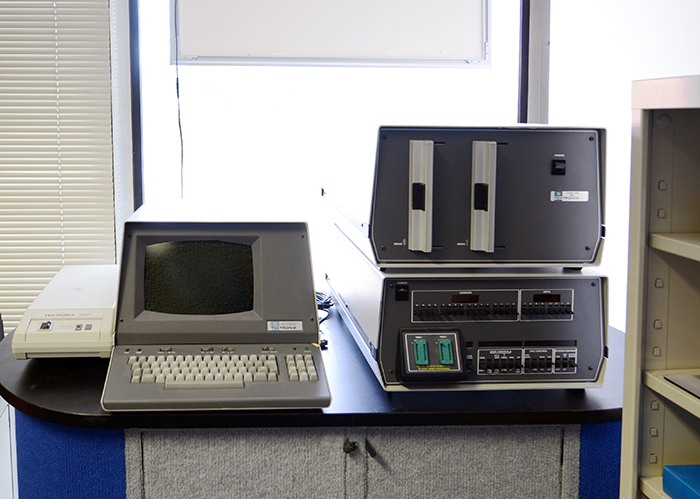 Our Microprocessor Development System display features a 4023 terminal and modem. 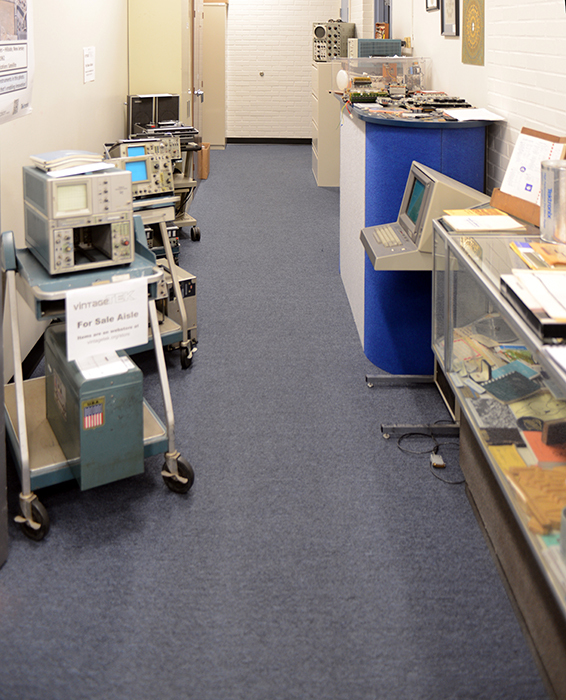 Our Hybrids Component Organization DEC PDP-8E exhibit is waiting for restoration. 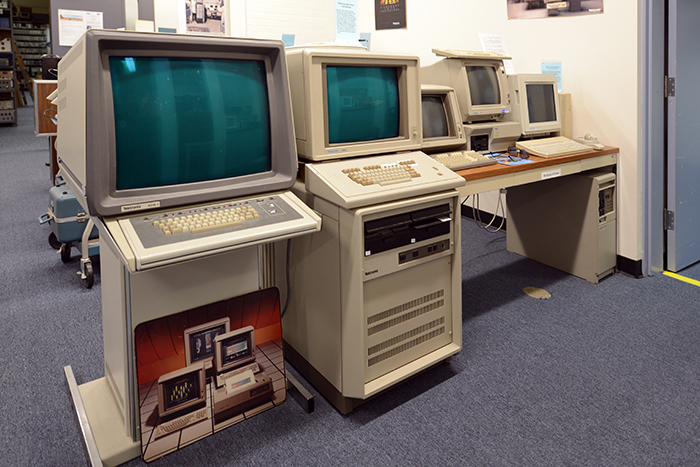 This exhibit features the first low-cost Network Displays X-Terminal. Our display cabinet features a lot of different Tek Memorabilia. 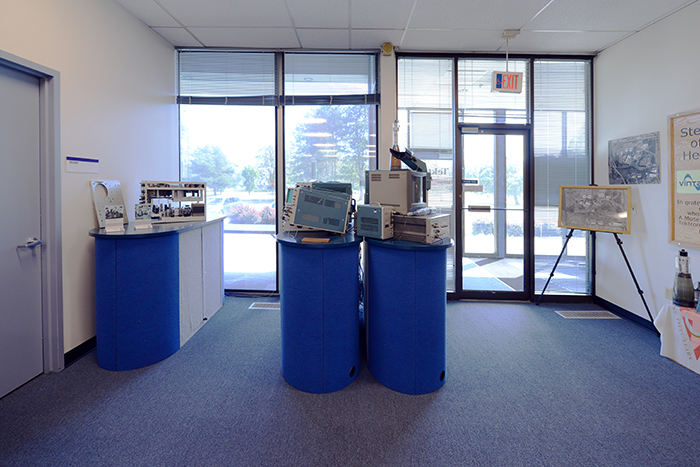 Instruments for sale are on the left while Printer and Integrated Circuit technology is on display on the right. Further down the aisle is our library of documentation, slides, photos, film, and video..
Our classroom is available for demonstrations, meetings, and STEM activities. 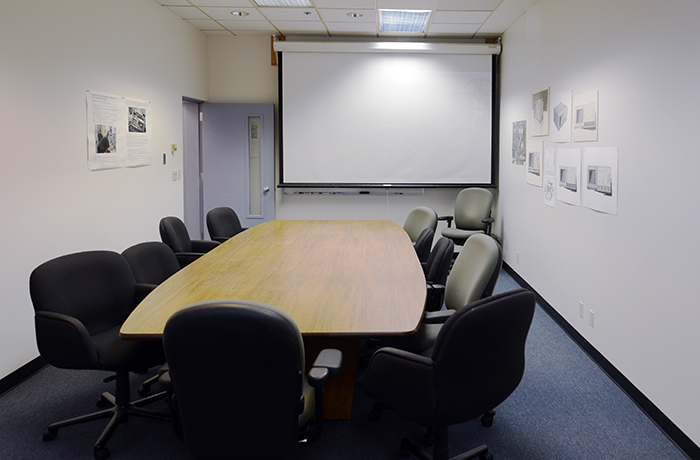 We also show 16 mm films and videos in this room.